ESIC form 22 is known as funeral expenses claim form, this is used to claim funeral expenses of deceased ESIC member. 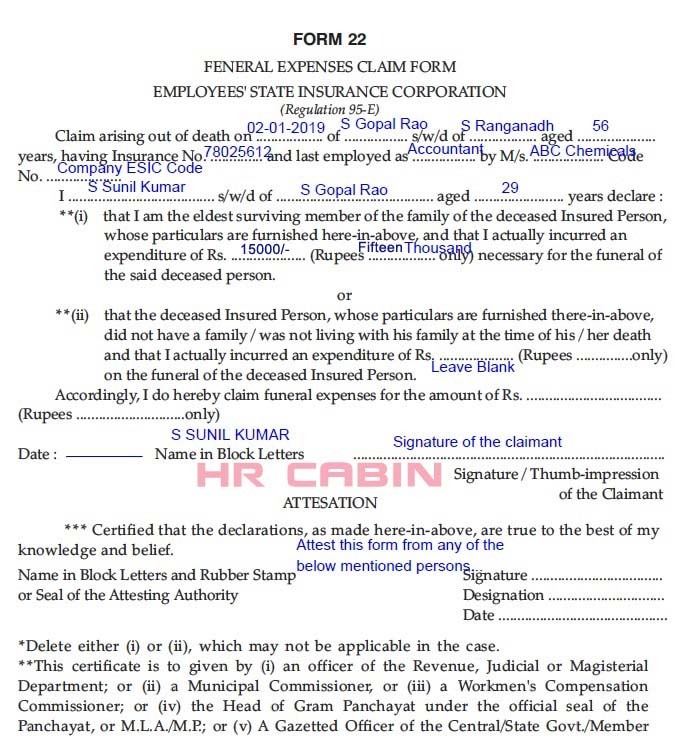 Under Employee State Insurance Scheme the dependents of deceased ESIC member can get 15000 Rs amount as funeral expenses (W.E.F 1 March 2019). The family members need to claim ESI funeral expenses within 6 months from the date of the death of the insured person. Here can know how to fill ESIC form 22 and also find sample filled ESIC form 22. Relationship name of the deceased person. Age of the deceased person. ESIC funeral benefit amount 15000 Rs (maximum). Name and details of the claimant. Officer of revenue or judicial or magisterial departments. Head of Gram Panchayat under the official seal of panchayat or MLA / MP. The claimant needs to submit ESIC Pehchan card along with funeral claim form in their regional ESIC branch office.